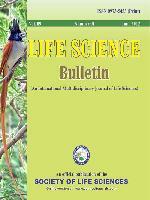 Life Science Bullegin provides a forum for publication of basic and applied researches in Life Sciences, development of techniques and procedures / laborarory investigations applied to the interpretations of field data. Thus it disseminates the knowledge of Scientific Research and recent technologies for the management and improvement of various fields of Life Sciences. This journal includes scientific research papers on all branches of Life Sciences to promote the research activities. Through this official publication, the society's activities are also highlited. The periodicity of Bulletin is twice a year, i.e. in June & December. NAAS had rated this journal in 2017 with a mark of 3.47 on a scale of 1 to 10.